Strategy: A small tube is inserted into the affected disc. This tube reduces tissue volume, by generating a high-frequency, electro-thermal field, in the liquid core of the intervertebral disc. What is Percutaneous Disc Nucleoplasty? Many patients with back pain show no clear indication of a herniated disc. However with MRI investigation protrusion of the intervertebral discs can be diagnosed. This protrusion can put pressure on nerves or the spinal cord and can cause persistent, or stress-related chronic back pain. Normally this kind of back pain (lumbar or cervical), responds well to conservative treatment options. For a thorough investigation and to discuss conservative treatment options, please contact our back and spine department. When will your neurosurgeon consider Nucleoplasty? If after six weeks, conservative treatment has not been successful, your spine specialist should consider an intradiscal procedure: The disc protrusion can be reduced by treating the liquid core of the spine simply by using an injection needle. This needle (cannula) allows a radiofrequency instrument to enter the core of the disc, thereby avoiding all the surgical risks associated with open back surgery. This is essentially the principle of the Nucleoplasty. Nucleoplasty, as a minimally invasive treatment, covers only smaller disc herniations or disc bulges that have not yet broken through the solid fibre ring of the disc and are therefore are not accessible via an open surgical procedure (surgical removal of the disc material). Internationally, more than 200,000 patients have already been treated with nucleoplasty, with a greater than 80% success rate. What is the principle of Nucleoplasty by thermal coblation? Coblation: Short for controlled ablation (removal or reduction of disc material). Coblation® is a patented and registered procedure. Nucleoplasty is a minimally invasive method for reducing the internal pressure of the spinal disc. The high pressure of the liquid core of the disc can lead protrusion or herniation, particularly if the walls of the disc are already degenerated. Nucleoplasty by thermal coblation is indicated if there is a significant protrusion with a bulging fibre ring, however, there should not be any evidence of disc herniation which has broken through the disc wall. The principle is based on a minimal shrinkage of the gelatinous disc nucleus. With the resulting shrinkage, the bulging disc retracts, the compressed nerve is released and the leg pain and back pain subside . The procedure is called Intradiscal Electro Thermal Therapy (IDET). Minimally invasive transcutaneous Endoscpic approach: The area around the spinal disc is not traumatized by open surgery, surgery takes place through a needle: muscles, nerves and bones stay intact, no surgical scar along the spine. Studies show success rate of up to 70% for patients with chronic back pain. With a proper diagnosis, the results are very reliable. Local sedation, avoiding total anesthesia. The patient is semiconscious during the surgery. This keeps surgical stress at a low level. Procedure takes 20-30 minutes. Which patients are suitable for Nucleoplasty? In this case please contact us to discuss alternative, preferably minimally invasive, treatment options with our spine specialists. Proper patient selection increases the probability of a good outcome. Patients require a thorough clinical checkup. The stability of the spine should be assessed with dynamic X-ray images. The discs can be investigated in detail via MRI imaging. Patients should have not more than one affected spinal disc (one segment) at a time. The pain should be caused by disc degeneration only. Before considering nucleoplasty, a patient should have undergone six weeks of intense conservative treatment, with no improvement in the pain situation. Conservative treatment should always be the priority in treating disc related back pain. Severe stenosis or facet joint degeneration cannot be treated with Nucleoplasty. The stability of the vertebral spine will also need to be assessed. Patients with spondylolysthesis (instability of vertebrae) are not suitable for Nucleoplasty. The disc degeneration must not be too advanced. If the disc is already severely collapsed (loss of diameter > 50%) the IDET treatment is not suitable. Patients with a sequestered disc herniation will also need an alternative treatment approach. Following partial anaesthesia, Specialist Neurosurgeons at the Gelenk-Klinik insert a thin needle through the back and into the herniated disc (x-ray control is used to guide the needle to the required spot). 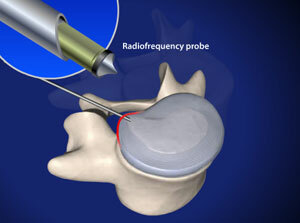 A small radio frequency probe is inserted through the needle and into the disc. This device sends pulses of radio waves to dissolve small portions of the disc nucleus. The temperature applied is low (40°-70°C). The empty space created by this procedure, allows the disc to reabsorb the herniated part of the disc, this in turn leads to pressure relief. After the needle is removed, the area is covered with a small bandage, no suturing is required. In detail: How does Nucleoplasty work? The fibrous ring of the intervertebral disc is strengthened by heating it's liquid core. The heat modifies the collagen fibrers of the annulus (spinal disc wall): the disc wall contracts and increases in thickness. The precise mechanism of IDET is still somehow speculative, however it is considered to decrease discogenic pain by two different mechanisms. Thermal destruction of disk nociceptors: denervation is also a widely used treatment strategy, with the potential of immediate pain relief. Pain relief after IDET surgery will continue for a few weeks. PLease keep in mind that physiotherapy is part of your recovery plan. After the Nucleoplasty procedure improvement may be gradual and full recovery can take up to three months. The chances of success with this method are very good with over 80 % patient satisfaction rates. The precondition for this success rate however, is thorough detailed medical investigation and patient selection. The Neurosurgical consultant needs to rule out all other possible causes of back pain. The surgical risks are reduced by this particularly minimally invasive approach. As there is no risk of damage to bones, muscles and nerves during surgery, this greatly reduces the potential for complications, speeds up the recovery time and improves the overall outcome. Patients may need one day of bed rest and may resume all normal activity within one to six weeks. Nucleoplasty treatment is however, only the first step of the long term solution. Recovery, including pain relief, will be gradual and can take 8-12 weeks to be complete. An extensive rehabilitation program will be necessary to ensure the success of the nucleoplasty. Physical activity should be monitored and only gradually increased.